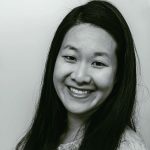 Published Sep 14, 2017 By Julia 6 CommentsThis post may contain affiliate links. 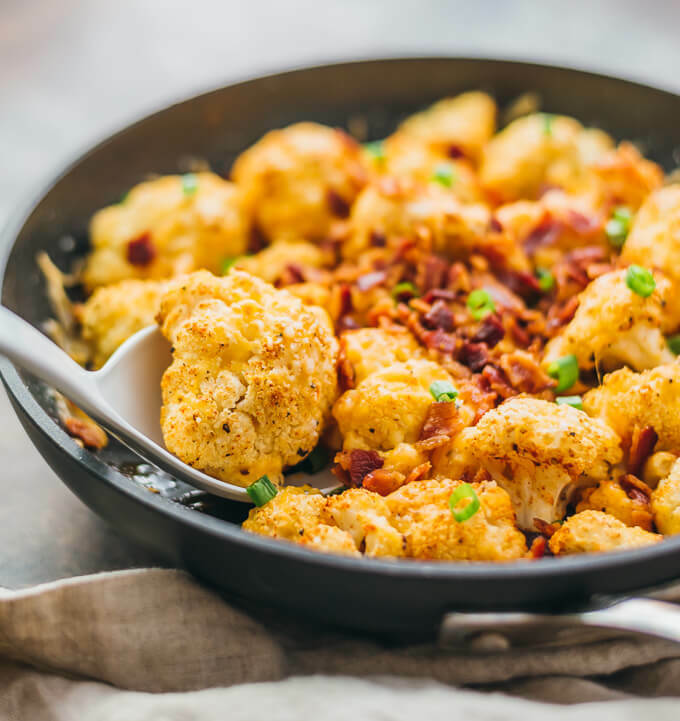 This easy roasted cauliflower is a super comforting low-carb meal, loaded with bacon and cheese. Sometimes I feel like I’m stuck in a rut, always cooking beef or chicken for dinner. Every now and then, I try to change things up and highlight a vegetable as the main focus of the dish, which also lets me explore seasonal vegetables. 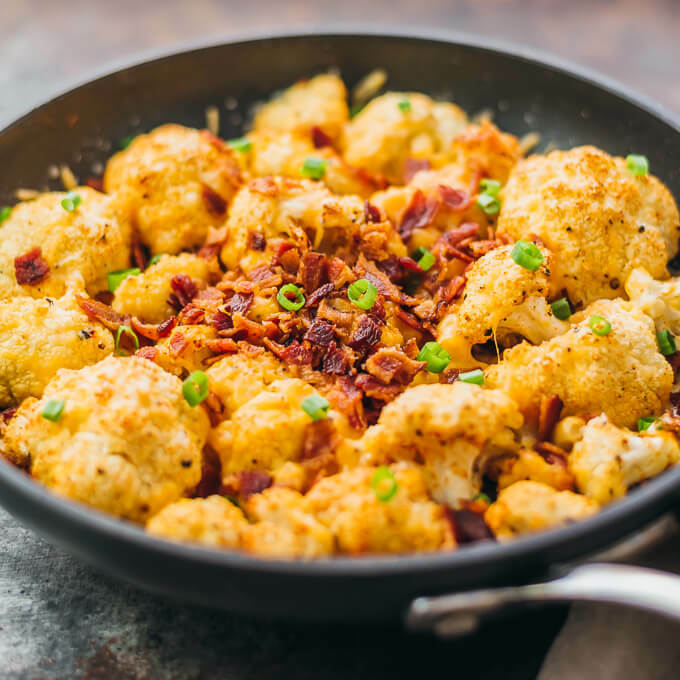 I haven’t cooked with cauliflower in a while, so I decided to make a simple roasted cauliflower skillet with bacon and cheddar and it did not disappoint. 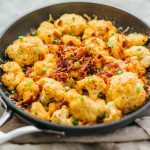 The cauliflower florets were tender and tasty, and the cheddar and parmesan cheese mix with crumbled bacon was nothing short of amazing. This was also a really simple dish that I could whip up with just 10 minutes of prep time. 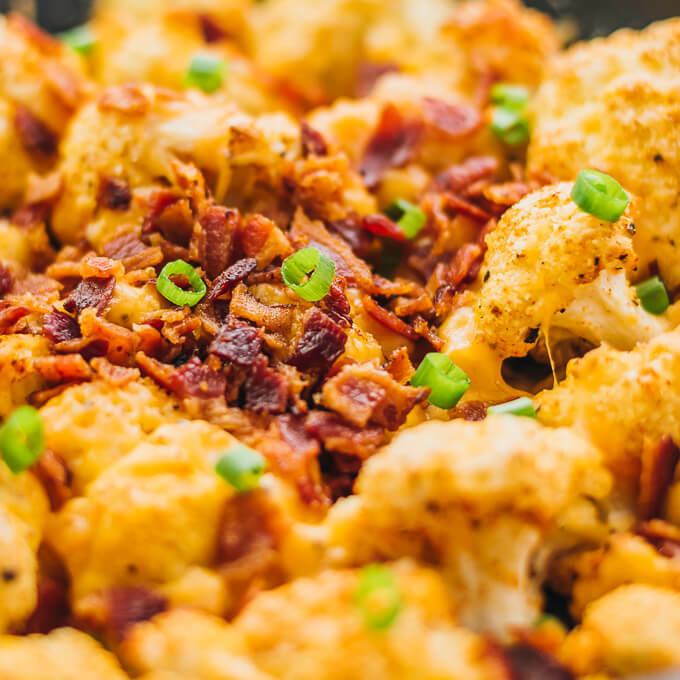 This loaded cauliflower is a great example of how low carb dinners can be amazingly tasty. When most people who haven’t tried a low carb lifestyle (such as keto or Atkins induction phase) think about low carb foods, they generally think they’re supposed to eat salads and lettuce wraps all the time. 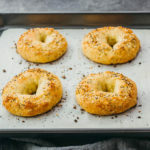 What they don’t realize is all of the delicious foods that are low in carbs, including any kind of protein (chicken, beef, pork, salmon, shrimp, bacon), cheese, and certain vegetables. This results in a ton of delicious combinations, and I’ve been having fun coming up with new low-carb dinners that are healthy as well as comforting. Eating low carb definitely doesn’t feel like you’re on a traditional diet. Let’s talk ingredient substitutions. I can’t imagine wanting to replace the cauliflower, but you could substitute it with broccoli if you prefer. Just watch the cooking time. For the cheese, you can use any kind you want. I used a mix of shredded cheddar cheese, grated parmesan, and grated asiago cheese. I loved the blend of flavors and the cheese really stands out. 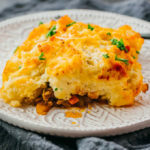 The rest of the recipe’s ingredients are pretty simple, and if you want to add some spices and herbs, you can toss them with the cauliflower florets prior to baking. If you’re looking for more low-carb and keto friendly meals, check out these stuffed portobello mushrooms, bacon wrapped jalapeno peppers, and ground beef and cabbage stir fry. Prepare a wide pan about 10 inches in diameter, safe for stovetop and oven use. Add bacon slices to the pan in a single layer. Cook over medium heat until crispy, 5 to 10 minutes, turning occasionally. Transfer bacon to a paper towel to drain. When cool, crumble into small pieces. Add cauliflower florets to a gallon resealable bag. Scoop 2 tablespoons of bacon grease from the pan into the bag. Toss to coat. If you used a large head of cauliflower and the florets don’t look coated, add another tablespoon of bacon grease and toss. Add paprika, salt, and pepper to the resealable bag. Toss until well mixed. Transfer cauliflower florets onto the same pan, spreading them out until evenly distributed on the pan. They should be sitting snugly against each other, mostly in a single layer. Place the pan in the oven and bake at 400 F until the tops of the cauliflower are just starting to brown, about 30 minutes. Take the pan out of the oven. Evenly distribute cheddar and parmesan/asiago cheese on top. Lastly, add crumbled bacon over the cheese. 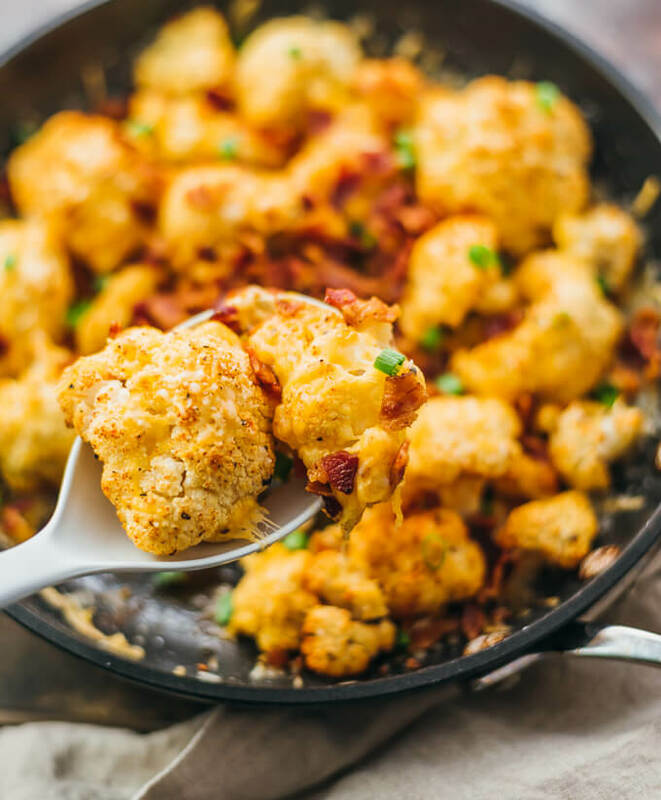 Return the pan to the oven and bake until the cheese is melted and the cauliflower is tender, about 5 minutes. Garnish the top with sliced scallions and serve. 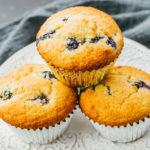 This recipe yields 8.5 g net carbs per serving. This came out amazing!!! TY!!! This looks delicious ! It’s definitely is going on my to-try list ! Love the colors of this dish as much as the aroma when making it! Not going to lie, this may be the most appetizing veggie I’ve ever seen. Cannot believe how good this looks! I will be trying this for sure. I have seen versions before but I like the way you guys do it! I will let you know. Thanks for sharing!